Hope College Theatre is presenting “Stage Door” through Saturday, April 27. The performances will be Friday and Saturday, April 26-27. All performances will be at 8 p.m. in the DeWitt Center main theatre. The comedic “Stage Door,” written by Edna Ferber and George Kaufman, takes place in Mrs. Orcutt’s boarding house, where 16 young women have taken up residence in order to pursue their acting careers. The audience gets to know the personalities of the women through the multitude of situations they encounter: love affairs, comedy, tragedy and outrageous moments. 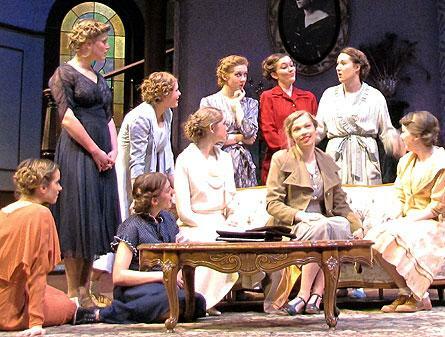 “Stage Door not only takes a humorous glimpse into the lives of young women trying to make it in the theatre in the 1930s, but the play also gives voice to the sacrifices and dilemmas artists often encounter to pursue their artistic endeavors that still resonates today,” said Michelle Bombe, professor of theatre and director of theatre. John Tammi, professor of theatre, directs “Stage Door.” Scene and properties design is by Todd Engle, resident scenic designer at Mason Street Warehouse in Saugatuck; costume design is by junior Angie Kurtz of Appleton, Wis.; and lighting and sound design is by Perry Landes, resident lighting designer and associate professor of theatre. The stage manager for the production is sophomore Jackie Marschke of Winnetka, Ill., and the assistant stage managers are sophomores Charlyn Pelter of Schererville, Ind., and Brittany Bernardi of Ventura, Calif. The cast includes Richard Perez, managing director of Hope Summer Repertory Theatre and assistant professor of theatre; Andrew Dell-Olio, professor of philosophy and chairperson of the department; freshman Kira Alsum of Grand Rapids; senior Mackenzie Anderson of Littleton, Colo.; freshman Andrea Antenan of Springfield, Ill; freshman Emilie Bickel of Denver, Colo.; senior Lydia Blickley of Grand Rapids; sophomore Austen Boer of Holland; freshman Tomas Brevnik of London, United Kingdom; freshman Tracy Bulthuis of Midlothian, Ill.; freshman Eliana Campbell of Barrington, Ill.; senior Kate Colburn of Holland; freshman Timothy Cook of Aurora, Ill.; freshman Callahan Davenport of Chennai, India; and junior Aiden DeJong of Holland. Also, freshman Hailey Fairchild of Hamilton; freshman Emma Fondell of Wilmette, Ill.; junior Kara Hartman of Wickenburg, Ariz.; junior Abigail Johnson of Redmond, Wash.; sophomore Taylor Ann Krahn of Mishawaka, Ind. ; sophomore John R. Haga of Rochester; sophomore Josh McCammon of Ann Arbor; sophomore Bridget McCarthy of Grand Haven; junior Jasmine Robb of Chippewa Falls, Wis.; freshman Madeline Scott of Glen Ellyn, Ill.; sophomore Allison Simmons of Port Huron; sophomore Alex Sloan of Ann Arbor; sophomore Jori Sportel of Kalamazoo; senior Jesse Swatling-Holcomb of Alameda, Calif.; freshman Matt Tallman of York, Pa.; senior Kaija von Websky of Holland; and freshman Kelsey Vredeveld of Jenison. Tickets for “Stage Door” are $10 for regular admission, $7 for senior citizens and Hope faculty and staff, and $5 for students, and are available at the ticket office in the main lobby of the DeVos Fieldhouse. The ticket office is open weekdays from 10 a.m. to 5 p.m. Tickets are also available online at https://tickets.hope.edu/ticketing/ or by calling (616) 395-7890. The DeVos Fieldhouse is located at 222 Fairbanks Ave., between Ninth and 11th streets. The DeWitt Center is located at 141 E. 12th St., facing Columbia Avenue at 12th Street. The Women’s Chamber Choir of Hope College, along with the college’s Luminescence and 12th Street Harmony vocal ensembles, will perform on Monday, April 15, at 7:30 p.m. in the sanctuary of St. Francis de Sales Catholic Church. JungWoo Kim, baritone, of the Hope College music faculty will present a recital on Saturday, April 13, at 7:30 p.m. in Dimnent Memorial Chapel.